Claimer.org: What strategy after Obama's u-turn in climate policy? What strategy after Obama's u-turn in climate policy? When Obama became President-elect in September 2008, he stated his priority as President, second only to revitalizing the economy with job creation, was going to be addressing climate change and cutting carbon dioxide emissions by 80 % by 2050. Now towards the end of his term he has done a u-turn on this policy goal and he seems to have all but forgotten this environmental issue. President Obama has failed to get such laws passed, Congress will not pass such a law because the senate will not agree to pass the proposed American Clean Energy and Security Act. In light of these events a group of U.S. based organizations and attorneys suggest a legal strategy to force state governments or the federal agencies such as the EPA to act directly. There idea is to sue these government agencies and state governments to get them to create and enforce such rules. To understand why such rules were not already implemented, one needs to look at the promises Obama made during interviews after becoming president-elect. He stated that he will pass laws to reduce heat-trapping carbon dioxide emissions by 80 % by 2050. Furthermore he promised to invest $150 billion in new technologies promoting green energies. 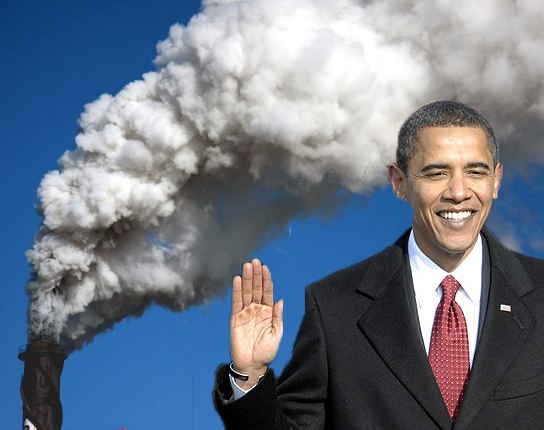 In February 2009 under Obama, with the Recovery Act of 2009, Congress did allocate $74 billion to green energies and energy saving technologies and $7 billion to the EPA. The EPA used the money to create a scheme to attempt to achieve a never before seen transparency of greenhouse gasses made by companies in the Unites States. The EPA created a Greenhouse Gas Reporting Program. At the end of 2009, the EPA started requiring that large emitters of climate altering emissions began collecting greenhouse gas (GHG) data under the new reporting system. This was to be the bases of calculating that the greenhouse gas emissions are to be dropped by 2050. The EPA is based on the rules of the Clean Air Act of 1963 last amended in 1990 so the Obama administration proposed a bill that would create a much needed new amendment to the Clean Air Act. A comprehensive act, American Clean Energy and Security Act of 2009, was drafted. It called for a reduction carbon emissions by 3 % in 2012 by 17 % in 2020 and 83 % in 2050 (as compared to 2005 levels) just as he promised during his campaign and this act would have created a scheme like the European Union's Emission Trading Scheme (EU ETS). The bill passed through the House on June 26, 2009 by 219-212 votes. Because the bill was drafted and passed in the house, for the bill to be passed into law it would need to go through the senate. But in February 2010, the 2007 report from the UN Intergovernmental Panel on Climate Change (IPCC) which declares that it scientifically proved global warming existed, was contested by, among others, republican attorney general for Texas, Greg Abbott. So by July 2010 the mood in congress changed because the mood of the nation changed and Democrat senator Harry Reid said that the senate could no longer pass such a bill because “We know that we don’t have the votes”. So the American Clean Energy and Security Act was never passed. In September 2010 Obama stated he was unhappy with the current development of the climate change policies, and promised more reform. But because this act will not pass through the senate, congress failed to pass legislative climate policy. Obama again promised that that change was coming, but now one year later he seems to be ignoring the issue and hoping we forgot about it. This climate legislation is lying dormant in Congress, Obama and lawmakers do not have the power to pass the bill. Moreover international climate talks are even further away from any sort of resolution years from resolution. Now the EPA is collecting the GHG data in the U.S., but without a clear road-map of what to do with the data collected from the Greenhouse Gas Reporting Program. Without laws passed by congress, we may not see a reduction of the GHG. This is where the overview at climate-one.org tries to explain how to get this result. In the article Phil Gregory, Senior Attorney at Cotchett, Pitre & McCarthy heading the Our Children’s Trust lawsuits explains how he plans to get the EPA to act. In the discussion, Phil Gregory states that we cannot implement statute based lawsuits, which means that we can’t just aim for one aspect of the problem, such as say that a polar bear is being affected by climate change take this one damage and ask the government to do something about it, because we are not trying to protect one instance, we need to protect the whole world. Instead we need to look at it in a more general macro level and go against the government to force the U.S. government to act on the issue of climate change. To show that there is something larger being put in danger and take this whole issue as a case to the court. To be able to take the whole issue into account he argues with the public trust doctrine and uses it to claim that the government should be acting as a trustee and protecting the public good of clean air, which these lawsuits should bring the courts to get the government to protect the climate, because they are legally obliged to do so. Nearly all experts studying the recent climate history of the earth now agree now the average surface temperature of earth has increased more than 1 degree Fahrenheit since 1900 and this is caused by those human activities, especially the release of heat-trapping GHGs. Most recently Richard Muller, a Berkeley physicist and until recently strong climate change critic and skeptic now agrees. And scientists agree that climate change should be stopped. Furthermore Phil Gregory states that showing that insurance agencies see this as a problem will also help the cause. And finally those bringing the issue to court may want to combine many examples of damages. Our organization agrees with this strategy as well, that is why we are collecting damage claims on the website www.Claimer.org/registerDamages. With these combined proofs and damages we can then better convince the courts that this is all part of the same issue and that the whole issue of climate change should be faced together, and that climate change is indeed creating a negative impact on our planet. When the court agrees with these proofs then the court could demand that the government, who refuses to pass laws on the subject, must the indeed act to control emissions. Update: Read more about the initiative of “Our children’s trust” in the U.S. mentioned in this article. reduce drilling fluid spills Very informative site. and katch kan offers the Oil Rig Safety and Drilling fluid containment system.